One of Sadie's favorite pastimes is putting on other people's shoes. She is quite skilled at slipping her tiny toes perfectly into Blake's flip flops and I'm not really exaggerating when I say she walks better in my high heels than I do! 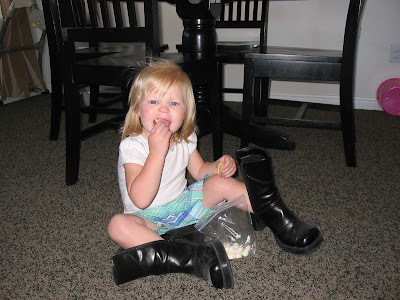 This is a picture of Sadie wearing my boots. Oh, and yes, she put them on all by herself! Okay, so what's the trick with the shoes? James is THREE and can't put his shoes on by himself very well. And once they are one, he rips them off in less than five minutes. I find his shoes all over the neighborhood!!! I want to know your secret with Sadie! Lindsey I am sure that Sadie and Laci are getting along beautifully! They are both shoe lovers! How many pairs of flip flops do you think Laci owns?! Maybe send Sadie with Laci the next time she needs a pair of shoes they would have a great time!